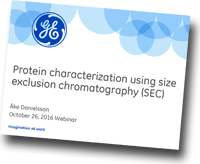 Separation Science, in collaboration wth GE Healthcare, offers an on-demand webinar in which you'll receive an introduction to size-exclusion chromatography (SEC) for protein characterization. Included are hints and tips for both high resolution and reproducibility of your analyses, as well as advice on selecting a pre-packed column for analytical SEC. Finally, the presentation will examine agarose-based resins. The webinar, presented by Åke Danielsson (Research Director, GE Healthcare Life Sciences), will cover SEC basics and what types of information can be generated by the technique, optimal analytical SEC system configuration, advice on columns and how to select the most appropriate one depending on the analytical challenge faced, and examples of protein characterization workflows using agarose-based SEC resins.